I am a geochemist with the Hydrological-Ecological Interactions Branch of the Earth System Processes Division of the USGS at Menlo Park, California. I completed a B.A. degree in English literature (Honors Program) at the Ohio State University in 1993, an M.S. in geology (geochemistry) at the Ohio State University in 1999, and a Ph.D. in environmental toxicology and chemistry at the University of California Santa Cruz in 2003. I pursued postdoctoral work at the University of California Santa Cruz, and with the USGS as a Mendenhall Scholar at the Pacific Coastal and Marine Science Center. I previously worked in the USGS National Research Program. My research has focused on the sampling and analysis of produced waters from geologic carbon sequestration studies, geochemical characterization of sediment transport in the coastal zone, the environmental chemistry of mercury in coastal regions, and water quality analysis for samples from areas of mineralized rock, mining activity, and wetlands. My current work focuses principally on using carbon isotopes as a tracer in hydrological and biogeochemical applications. Mackelprang, R., Burkert, A., Haw, M., Mahendrarajah, T, Conaway, C.H., Douglas, T.A., and Waldrop, M.P. (2017) Microbial survival strategies in ancient permafrost: insights from metagenomics. ISME Journal. DOI:10.1038/ismej.2017.93. Conaway, C.H., Thordsen, J.J., Manning, M.A., Cook, P.J., Trautz, R.C., Thomas, B., Kharaka, Y.K. (2016) Comparison of geochemical data obtained using four brine sampling methods at the SECARB Phase III Anthropogenic Test CO2 injection site, Citronelle Oil Field, Alabama. International Journal of Coal Geology 162: 85–95. Neumann, R.B., Blazewicz, S.J., Conaway, C.H., Turetsky, M.R., Waldrop, M.P. (2016) Modeling CH4 and CO2 cycling using porewater stable isotopes in a thermokarst bog in Interior Alaska: Results from three conceptual reaction networks. Biogeochemistry 127(1): 57–87. DOI 10.1007/s10533-015-0168-2. Stoliker, D.L., Repert, D.A., Smith, R.L., Song, B., LeBlanc, D.R., McCobb, T.M., Conaway, C.H., Hyun, S.P., Koh, D.-C., Moon, H.S., Kent, D.B. (2016) Hydrologic controls on nitrogen cycling processes and functional gene abundance in sediments of a groundwater flow-through lake: Environmental Science & Technology 50(7): 3649–3657. http://dx.doi.org/10.1021/acs.est.5b06155. Swarzenski, P.W., Johnson, C.D, Lorenson, T., Conaway, C.H., Gibbs, A., Erikson, L, Richmond, B., and Waldrop, M. (2016) Seasonal electrical resistivity surveys of a coastal bluff, Barter Island, North Slope Alaska. Journal of Environmental & Engineering Geophysics 21(1): 37–42 doi:10.2113/JEEG21.1.37. Conaway, C.H., Thomas, R.B., Saad, N., Thordsen, J.J., and Kharaka, Y.K. (2015) Carbon isotope analysis of dissolved organic carbon in fresh and saline (NaCl) water via continuous flow cavity ring-down spectroscopy following wet chemical oxidation. Isotopes in Environmental and Health Studies. DOI: 10.1080/10256016.2015.1009910. Conaway, C.H., Draut, A.E., Echols, K.R., Storlazzi, C.D., and Ritchie, A. (2013) Episodic suspended sediment transport and elevated polycyclic aromatic hydrocarbon concentrations in a small, mountainous river, coastal California. River Research and Applications 29: 919–932. Kharaka Y.K., Thordsen, J.J., Conaway, C.H., and Thomas R.B. (2013) The energy-water nexus: Potential groundwater-quality degradation associated with production of shale gas. Procedia Earth and Planetary Science. 7: 417–422. Conaway, C.H., Draut, A.E., Storlazzi, C.D., Swarzenski, P.W. (2013) Short-term variability of 7Be atmospheric deposition and watershed response in a Pacific coastal stream, Monterey Bay, California, USA. Journal of Environmental Radioactivity 120: 94–103. Ganguli, P.M., Conaway, C.H., Swarzenski, P.W., Izbicki, J., and Flegal, A.R. (2012) Mercury speciation and transport in a California coastal lagoon system: The role of submarine groundwater discharge and monomethylmercury production. Environmental Science & Technology 46(3): 1480–1488. Conaway, C.H., Swarzenski, P.W., and Cohen, A.C. (2012) Recent paleorecords document rising mercury contamination in Lake Tanganyika. Applied Geochemistry 27(1): 352–359. Gallon, C, Ranville, M.A., Conaway, C.H., Landing, W., Buck, C., Morton, P., and Flegal, A.R. (2011) Asian industrial lead inputs to the North Pacific evidenced by lead concentrations and isotopic compositions in surface waters and aerosols. Environmental Science & Technology. 45(23):9874–82. Conaway, C.H., Black, F.J., Weiss-Penzias, P., Gault-Ringold, M., and Flegal, A.R. (2010) Mercury speciation in Pacific coastal rainwater, Monterey Bay, California. Atmospheric Environment 44(14), 1788–1797. David, N., McKee, L.J., Black, F.J., Flegal, A.R., Conaway, C.H., Schoellhamer, D.H., and Ganju, N.K. (2009) Mercury concentrations and loads in a large river system tributary to San Francisco Bay, California, USA. Environmental Toxicology and Chemistry 28(10) 2091–2100. Black, F.J., Conaway, C.H., and Flegal, A.R. (2009) Stability of dimethyl mercury in seawater and its conversion to monomethyl mercury. Environmental Science & Technology 43(11), 4056–4062. Conaway, C.H., Black, F.J., Gault-Ringold, M., Pennington, J.T., Chavez, F.P., and Flegal, A.R. (2009) Dimethylmercury in coastal upwelling waters, Monterey Bay, California. Environmental Science & Technology 43(5), 1305–1309. Conaway, C.H., Ross, J.R.M., Looker, R., Mason, R.P., and Flegal, A.R. (2007) Decadal mercury trends in San Francisco Estuary sediments. Environmental Research 105(1), 53–66. Conaway, C.H., Pride D.E., Faure, G., and Tettenhorst, R.T. (2005) Mineralogical and geochemical investigation of sediment in the Snake River arm of the Dillon Reservoir, Summit County, Colorado. Lakes and Reservoirs: Research and Management 10, 235–242. Conaway, C.H., Mason, R.P., Steding, D.J., and Flegal, A.R. (2005) Estimate of mercury emission from gasoline and diesel fuel consumption, San Francisco Bay area, California. Atmospheric Environment 39(1), 101–105. Flegal, A.R., Conaway, C.H., Scelfo, G.M., Hibdon, S., Sañudo-Wilhelmy, S.A. (2005) Factors influencing measurements of decadal variations in metal contamination in San Francisco Bay, California. Ecotoxicolgy 14(6), 645–660. Conaway, C.H., Watson, E. Flanders, J.R., and Flegal, A.R. (2004) Mercury deposition in a tidal marsh of south San Francisco Baydownstream of the historic New Almaden mining district, California. Marine Chemistry 90(1–4), 175–184. Conaway, C.H., Squire, S., Mason, R.P., and Flegal, A.R. (2003) Mercury speciation in the San Francisco Bay estuary, Marine Chemistry 80, 199–225. Thomas, M.A., Conaway, C.H., et al. (2002) Mercury contamination from historic mining in water and sediment, Guadalupe River and San Francisco Bay, California. Geochemistry: Exploration, Environment, Analysis, 2(3), 211–217. Marvin-DiPasquale, M.C., Naftz, D.L., Krabbenhoft, D.P., Anderson, Mark, Boyd, E.S., Aiken, G.R., Conaway, C.H., Ogorek, J.M., Poulin, B.A., Fuller, C.C., Antweiler, R.C., and Stricker, C.A. 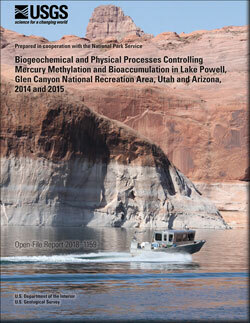 (2017) Data for Biogeochemical and Physical Processes Controlling Mercury Methylation and Bioaccumulation in Lake Powell, Glen Canyon National Recreation Area, Utah and Arizona, 2014-2015: U.S. Geological Survey data release, https://doi.org/10.5066/F74X560J. Flegal, A.R., Gallon, C., Ganguli, P.M., and Conaway, C.H. (2013) All the Lead in China. Critical Reviews in Environmental Science and Technology 43, 1869–1944. Black, F.J., Conaway, C.H., and Flegal, A.R. (2012) Mercury in the Marine Environment. In Bank, M.S. (editor) Mercury in the Environment: Pattern and Process. University of California Press, Berkeley, CA. Draut, A.E., Conaway, C.H., Echols, K.R., Storlazzi, C.D., and Ritchie, A. (2011) Suspended sediment and organic contaminants in the San Lorenzo River, California, water years 2009–2010: U.S. Geological Survey Open-File Report 2011-1120, 24 p.
Storlazzi, C.D., Conaway, C.H., Presto, M.K., Logan, J.B., Cronin, K., van Ormondt, M., Lescinski, J., Harden, E.L., Lacy, J.R., and Tonnon, P.K. (2011) The dynamics of fine-grain sediment dredged from Santa Cruz Harbor: U.S. Geological Survey Open-File Report 2011-1045, 110 p.
Conaway, C.H. (2008) Mercury in small order streams in areas contaminated by mercury mining: Site characterization and remediation. Report to the San Francisco Bay Regional Water Quality Control Board, Oakland, CA. Conaway, C.H., Black, F.J., Grieb, T.M, Roy, S., and Flegal, A.R. (2008) Mercury in the San Francisco Estuary. Reviews of Environmental Contamination and Toxicology 194, 29-54. Flegal, A.R., Davis, J.A., Connor, M.S., Conaway, C.H. (2007) Sources, transport, fate, and toxicity of pollutants in the San Francisco Bay estuary. Introduction to the Special Issue on Pollutants in the San Francisco Bay Estuary. Environmental Research 105(1), 1–4. Conaway, C.H. (2005) Sources, Transport, and Fate of Mercury in San Francisco Estuary and Tributaries. Ph.D. Dissertation. Department of Environmental Toxicology, University of California at Santa Cruz. 134 p.
Conaway, C.H., Fleming, T.H., and Elliot, D.H. (2005) Preliminary investigation of the secondary minerals in the Kirkpatrick Basalt, Prince Albert Mountains. Antarctic Journal of the United States 33, 344–347. Conaway, C.H. and Flegal, A.R. (2003) Toxicology. In: Stapleton, R. M. (editor) Pollution A to Z. Macmillan Reference USA, New York, p. 250–252. Conaway, C.H. (1999) Geochemical investigation of water and sediment in the Snake River Arm of the Dillon Reservoir, Summit County, Colorado. Master's thesis, Ohio State University, Columbus. Bennett M.J., Ponti D.J., Tinsley J.C.I., Holzer T.L., and Conaway C.H. (1998) Subsurface Geotechnical Investigations Near Sites of Ground Deformation Caused by the January 17, 1994, Northridge, California, Earthquake. US Geological Survey Open File Report 98-373, 145 pp. Elliot D.H., Fleming T.H., Conaway C.H., and Braddock P. (1998) Geologic studies in the Prince Albert Mountains. Antarctic Journal of the United States 32(5), 14–15. Swarzenski, Peter W.; Johnson, Cordell; Lorenson, Thomas; Conaway, Christopher H.; Gibbs, Ann E.; Erikson, Li H.; Richmond, Bruce M.; Waldrop, Mark P.